A riddle, wrapped in a mystery, inside an enigma: my unexpectedly fun and rewarding discovery of Russia. 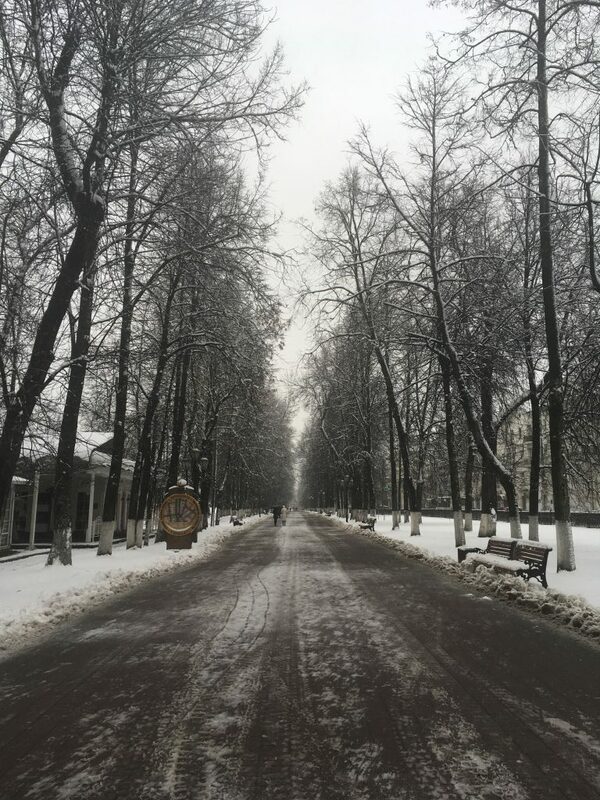 In this post, current undergraduate Joseph Rattue, who studys at Somerville College, offers a candid and entertaining reflection on his year abroad while studying Russian from scratch. Four years ago, I sat looking through some testimonials in Oxford Modern Languages leaflets at an open day, in awe of the list of amazing places students had been on their years abroad. With law internships in Berlin, banking placements in Zürich, and events management in various châteaux in the picturesque French countryside, it was a list of great promise. A list that would convince anyone of the excitement and glamour of a degree in French, Spanish, German or Italian at Oxford. A list from which the location of the year abroad for Beginners’ Russian was markedly and suspiciously absent. After some digging around on the internet through the Russian sub-faculty’s web page, I found the city where second-year Russian Ab Initio (from scratch) students go for their year abroad, and didn’t think much of it in the face of the cosmopolitan metropoles I’d read about earlier that day. Today I have a photo plate of it on the wall above my bed. Yaroslavl. Probably not the first word that comes to mind when you think of a place to spend your year abroad. Unknown to most people outside Russia, it sits modestly 272.3 km north-east of Moscow, and a trying 13-hour overnight train ride south-east of St. Petersburg. If I thought the scale of these distances was daunting before I arrived at the airport “in” (45.8 km south of) Moscow, it got even more extreme when I asked the minibus driver when we would reach the train station to go to Yaroslavl, only to discover that Yaroslavl was considered “next to Moscow,” as the 6-hour bus ride ensued. After the 5am start in the UK, it would be fair to say we all slept pretty well that night once we’d arrived at our home stay hosts’ flats. For anyone wondering why I haven’t mentioned what we were actually doing there, fear not. All in good time. First, though, there are some things to do with the structure of the Russian Ab Initio Course which need some explaining. If you read the opening of this post and were a bit puzzled about why I talked about second-years going abroad, you were right to pick up on this. Nearly all Modern Languages degrees at Oxford are arranged for students to go abroad in their third year, unless the degree includes Beginners’ Arabic or Beginners’ Russian, in which case the second year is the year abroad. If you do Beginners’ Russian, you spend the whole of the first year doing almost exclusively language work, with a 1-hour poetry reading class every week in the second term designed mainly to help with the resonance of words, and to give the basic outline of some literary movements in Russia. In their second year, all the Oxford Russian Ab Initio students go to Yaroslavl and do a language development programme designed specifically for them by Yaroslavl State University, making it easier to tackle Final Honours texts in Russian in the third and fourth years. Yes, this can have its downsides; you are away when your friends are back home in Oxford, and your linguist friends are away in third year when you come back. But this does not exactly spell the end for your social life. Without sounding too cheesy, it would not be an exaggeration to say that my social experiences on my year abroad were some of the best I’ve ever had. I went to a new place, discovered a new culture, and made new friends, many of whom will be in Oxford with me this coming year and mean a lot to me. It’s not often that you go to a monastery with a bear called Masha inside it, or a café where tens of cats live, or a museum with a whole room dedicated to different kinds of traditional irons which can also be musical instruments. Nor is it every day that you sing traditional Russian folk songs and drink mulled wine with your teachers to celebrate “Old New Year” in mid-January because Russia used the old Julian calendar until February 1918. It is these sorts of things that have made my year abroad not only so much fun, but so meaningful and fulfilling. Being in a class with the other Oxford students gave me an immediate group of close friends, and together we discovered Russia. Whether it was watching Yaroslavl Lokomotiv play ice hockey with our Russian friends, staying up to see the sun rise over the Winter Palace in St. Petersburg, or belting out Russian pop songs about new year at 1am, the year could hardly have been more full of shared, new experiences that brought us closer to each other and to Russian culture. The other people who made all this possible were our hosts, or “babs” (short for “babushka,” the Russian for “grandma”), who lived with us, fed us, and shared their stories, ideas and lives with us. When I met my bab, Emma, at the start of the year, I could hardly understand a sentence she said. By the end, I was interpreting for her as she told my parents all about her family, past and present, and which English writers she liked reading. I visited Yaroslavl again this summer, 4 months after the end of my year abroad in March, and left a box of chocolates for my friend to give to Emma when she got back from her holiday. Two days ago Emma got those chocolates, and said hi. All in all, it has been an unforgettable year, one full of discovery, new people, and both academic and personal growth. What felt like a very foreign country now feels like a second home to me. To that end, the Yaroslavl year abroad is the epitome of what a year abroad should be.